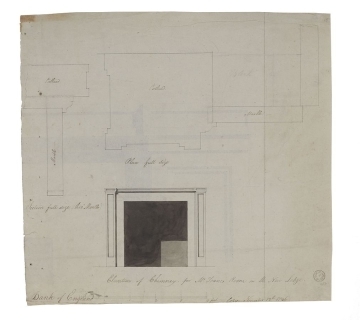 Drawings 4 and 5 show a chimney-piece designed for Soane's own room at the Bank, in the New Lodge. Drawing 4 shows a fairly simple design and the materials are labelled: Portland stone and marble. 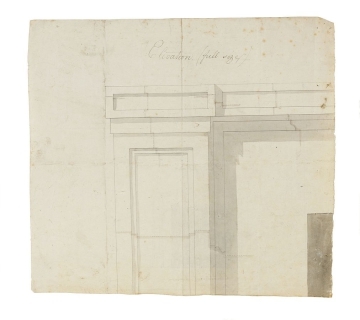 The designs must have been intended for 'Mr Pritchard', who had already 'sent the marble chimney to the Bank' and was required to produce the architrave mouldings to surround it (as per inscription). Drawing 5 shows an almost exact copy of drawing 4 and is inscribed 'Copy', though dated three days earlier than drawing 4. 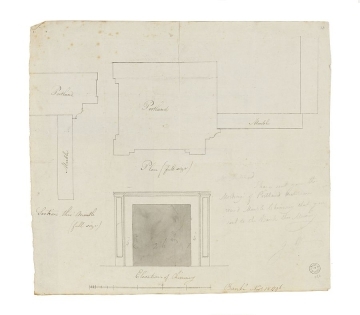 It follows that both designs may be copies of a lost original working drawing retained by the mason.